Home / News / It has been published the statistical publication "Aspects of the standard of living of the Population"
It has been published the statistical publication "Aspects of the standard of living of the Population"
National Bureau of Statistics informs about the publishung of the statistical publication "Aspects of the standard of living of the Population". The publication contains information regarding main social and economic aspects which characterize the welfare level of the population, especially incomes, expenditures, housing conditions, availability of durable goods, household food consumption etc. 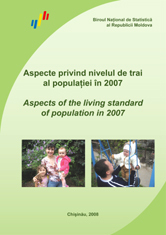 The information is presented based on the Household Budget Survey in the Republic of Moldova for 2007. For the main indicators methodological notes are presented.